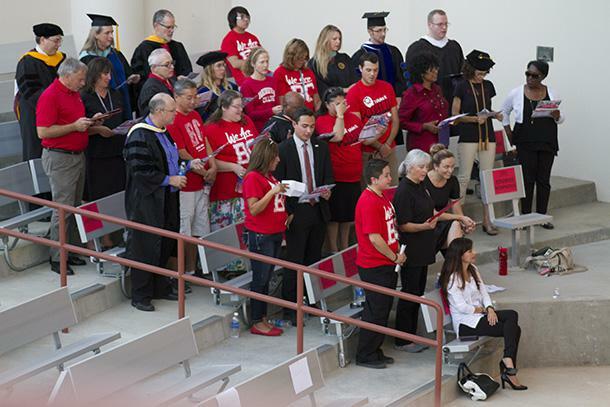 With the fall semester about to begin at Bakersfield College, there was a New Student Convocation where new students and parents of new students were welcome to attend. “The event is to acknowledge students beginning a path to education… it’s to get them engaged to how students should be,” said BC Director of Student Life Nicky Damania. The convocation was held on Aug. 20 at BC in the outdoor theater. It was free to attend, and dinner was provided by BC Food Services. New students were also given the opportunity to take a golf cart tour around campus. As students arrived, they were able to talk to the Office of Financial Aid, Disabled Students Programs, Students Health Center, BC Job Placement, and the Computer Science Club as they all had booths at the event. The inaugural part of the event started at 7:13 p.m. The significance behind 7:13 p.m. is that in military time it is 19:13, and BC was founded in 1913. The BC Drumline drew the crowd in with an opening performance. The BC Chamber Choir then sang the national anthem and later gave another performance that exemplified the strength a student must need to get through stressful times. After all that excitement, BCSGA President Clayton Fowler, Dean of Precollegiate and Student Success Janet Fulks, Academic Senate President Steven Holmes, and BC President Sonya Christian all spoke to the new students and parents. “My single message to students is just say yes when you are invited, and you are going to get a lot of invitations here at Bakersfield College,” said Christian. An oath was taken by the parents as they repeated after Fulks. This oath was to have the parents of the new students promise that they will support their children as they pursue their goals as a student. Fowler had the new students rise and take the BC Renegade Student Oath. This is a promise that the new students make to themselves in order to be a successful student. “At BC, you will receive a world-class education and join a community that will stretch beyond your time here. Embrace this opportunity and all that comes with it,” said Fowler. In Fowler’s speech, he mentions the fact that some people look at community college as a failures way to still attend college. He then admitted that he felt this way when he was a new student. “I quickly came to find out that BC was actually a positive step in my educational career. Professors I have encountered showed me guidance, trust, and inspiration during my academic career,” said Fowler. The new students are expected to know that the BC community is there to show them support whenever they need it, and that their success relies on their responsibility as a student.